So you’ve managed to bag this amazing large venue; the only problem is that it’s too big for your event. You don’t want to give it up because of the location or the history or the elegance of it. So how do you make it appear full or more intimate to your clients? By using furniture you can create a cosy feel to your event, or you can even make it look like your event is packed full of guests. There are a few general rules, for example, separate different activities within your event into certain areas of the venue. A wedding, for instance, may include a sit-down meal, speeches and dancing. So already you have three different spaces you can use to make a large venue appear smaller. One way to fill a large venue by using furniture is to use long trestle tables for the sit-down meal. These can be positioned in rows either horizontally or vertically. You can also use them for a buffet-style wedding where guests help themselves. One trick is to not position them flush against the wall of the venue but to leave a space so that guests can walk around them. You can easily make your large venue appear full by adding a dance floor. Surround it with LED poseur tables so that guests can dance and mingle at the same time. If there are children at the wedding you can cordon off an area and add a few games to keep them occupied. You can always use the same number of tables, just seat fewer people at them. So a table that usually seats 8 to 10 people can be used to now seat 6 people. Fill the space on the table instead of the venue space by adding rose petals or glitter onto the table. No one wants to turn up at a party to a large venue with a few guests milling around. But this is another chance to use the space creatively. Have a section for the food where guests can help themselves to nibbles. Then use another area for the drinks. You can even hire a separate bar and make this area into a quiet, more intimate space by using sofas and comfy chairs with low tables. Use soft lighting to create a different mood. Have an area dedicated to dancing but dot this space with LED cubes so that it doesn’t just look like dead space. If the venue is really big then why not use some of it as a make-shift cloakroom and set up coat rails to hang your guest’s coats on as they walk in? Include a photo booth. This can take up as much space as you want with the props and the size of the booth totally at your discretion. Typically at awards ceremonies, you have a stage and an audience so there’s little you can do to make a large venue appear full. However, you can play around with the seating a bit. Recipients of awards will have to walk up to the stage to collect what they have won. With this in mind, it makes sense to have aisles in the seating so they can easily get out of their seats and quickly walk to the stage. So instead of arranging a blanket spread of seats, lay out a few rows then leave a big gap before starting the next few rows. This will fill up a large venue. 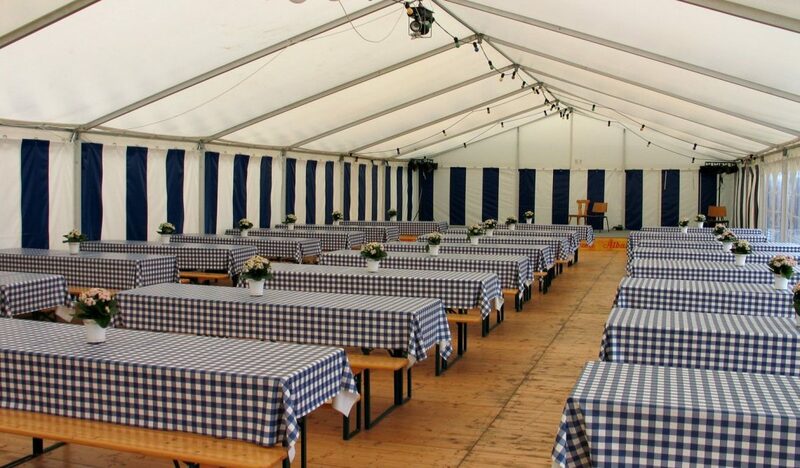 Finally, if you have a very large venue, say one that holds a thousand guests and your event is catering for just a hundred, it can look empty and pretty dismal. However, there are still ingenious ways to create an intimate atmosphere. Don’t be tempted to space out tables in an attempt to make space look smaller, it won’t work. Instead, your guests will feel isolated from each other. Group tables together and use lighting to focus their attention. Put rope barriers alongside a red carpet to direct them to their tables and use spotlights to highlight the route. Then flood the table area and keep all the empty spaces dark.